Thunderbird does not include its own calendar. In these instructions, we use the free Lightning add-on on a PC with Windows 7. Install the Lightning Thunderbird add-on and restart Thunderbird. Press Alt + D to open the File menu. In the Location field, enter the path https://calendar.mail.com/begenda/dav/your mail.com e-mail address/calendar . 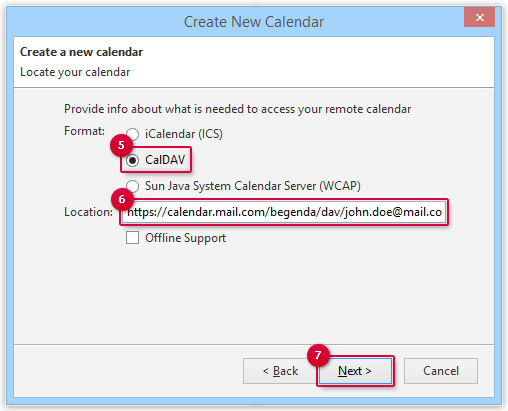 Example: For the e-mail address john.doe@mail.com, you enter https://calendar.mail.com/begenda/dav/john.doe@mail.com/calendar/ as the location. Give the mail.com Organizer a name and, if applicable, a color. Appointments from this calendar will later be displayed in the color. Click Next. Enter your mail.com e-mail address and password. Confirm by clickingOK. Your mail.com "My Calendar" default calendar is now synchronized with Mozilla Thunderbird.